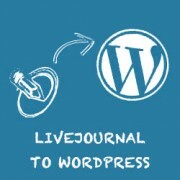 Do you want to switch your LiveJournal site to WordPress? While LiveJournal is a nice place to publish your journal entries, it is extremely limited which is why many users move to WordPress. 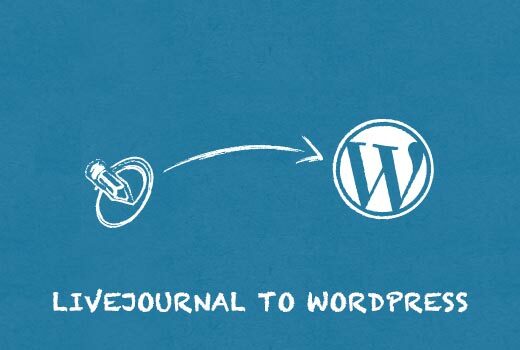 Recently one of our readers asked if we can create a step by step guide on migrating from LiveJournal to WordPress. In this article, we will show you how to move your blog from LiveJorunal to WordPress. Unlike other platforms, LiveJournal does not allow you to setup redirects. This means that users visiting your old LiveJournal site will not be automatically redirected to your self hosted WordPress.org site. Your only hope is to delete your LiveJournal account and wait for search engines to crawl and rank your new site. Even if you delete your old LiveJournal account, search engines will keep showing it in results for some time. Another issue is that WordPress importer will not import your images. You can either download your images from LiveJournal and upload them manually, or you can follow instructions in our tutorial on how to import external images in WordPress. Why you Should Move From LiveJournal to WordPress? First, let’s make it clear that when we say WordPress, we mean self-hosted WordPress.org site and not the free WordPress.com blog. Please take a look at our guide on the difference between WordPress.com vs WordPress.org site. LiveJournal comes with features like protected posts, friends, communities, etc. However, it is very limited in terms of how you display or control your journal. The basic free plan is even more limited than the paid plans. On the other hand, WordPress allows you to create password protected posts (journal entries are called posts in WordPress). It has nested comments just like LiveJournal. It does not have communities feature, but you can connect your WordPress site to other online communities and even run your own using a WordPress forum plugin. WordPress is open source and free (as in freedom). You own your content, and you can do whatever you want with it. You are free to extend your journal in any way you want. You can even make money out of your WordPress site. Still not convinced? See our guide on why you should use WordPress for more reasons to switch. Once you have signed up for WordPress hosting and set up your domain name, the next step is to install WordPress on your hosting account. We have a step by step tutorial on how to install WordPress. Once you have installed WordPress, it is time to move your content from LiveJournal to WordPress. WordPress comes with a nifty import tool that automatically imports your LiveJournal entries, comments, and tags into WordPress. Simply visit Tools » Import page and click on LiveJournal. 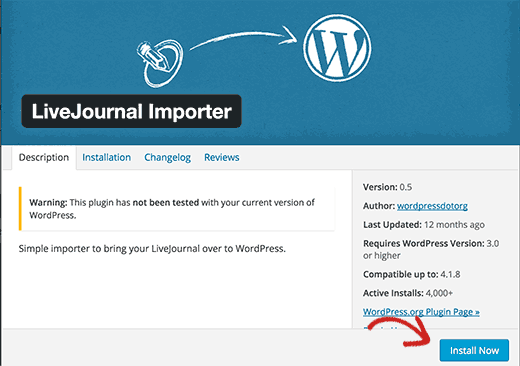 WordPress will now show you a popup to install the LiveJournal importer plugin. You may see a warning about the plugin not tested with your version of WordPress. You can safely ignore this and click on Install Now button. 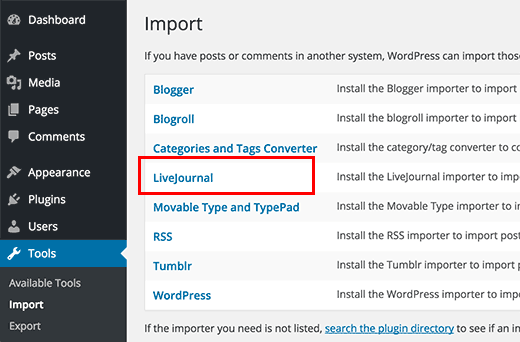 The LiveJournal Importer plugin will now be installed on your WordPress site. You will need to click on activate plugin and run importer link. 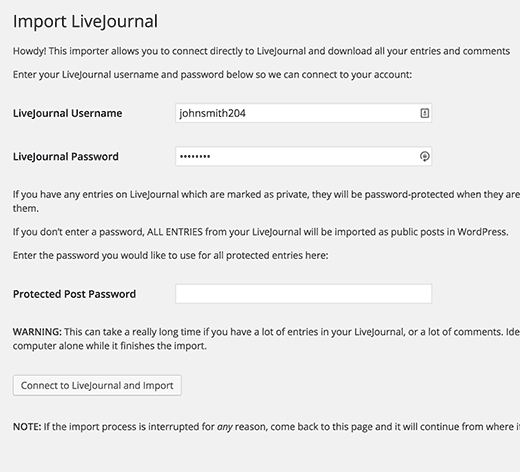 You will now see the LiveJournal Importer page where you need to enter your LiveJournal username and password. This allows your WordPress site to access your content on LiveJournal. If you have password protected posts on your LiveJournal site, then you will need to enter a password which will be used on all protected posts. Once you are done, click on the ‘Connect to LiveJournal and Import’ button. WordPress will now start importing your content. The process is divided into different steps and may take a long time if you have many entries and comments. If it fails abruptly during the import, then you can safely retry again. The importer is smart enough to avoid duplicate entries. You will see a success message when the importer has finished its job. You can now visit Posts section to see all your posts. The first customization that most beginners want to try is WordPress Themes. There are thousands of free and paid WordPress themes that you can install on your website. See our guide on selecting the perfect theme for WordPress. The real power of WordPress lies in the plugins. There are thousands of free WordPress plugins that you can install on your WordPress site right away. See our expert-pick of 20 must have WordPress plugins for 2015 or take a look at the plugins we are using in WPBeginner’s Blueprint. We understand that most beginners will need help with the new platform. WPBeginner is the largest unofficial WordPress resource site on the planet. We have free tutorials, guides, and videos to help you quickly learn WordPress. See how you to make the most out of WPBeginner’s free resources. We hope this article helped you move from LiveJournal to WordPress. You may also want to see our list of 40 useful tools to manage and grow your WordPress blog. Doesn’t work. Plugin can’t login to Livejournal, so there is no way importing posts to WordPress. Thanks for letting us know, we’ll certainly take a look at alternative methods.